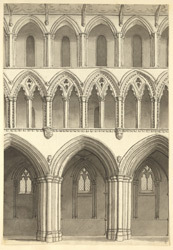 An elevation in ink of part of the nave of St Alban's abbey church in Hertfordshire. Spanning some 292 feet, this is the longest nave of any English church, and perhaps the longest Gothic-style nave in the world. The abbey church was built from recycled Roman brick between 1077 and 1115 on the execution site of Alban, Britain's first martyr.